When you start to learn English, one of your first challenges is to learn basic vocabulary. expanding your vocabulary; taking your existing knowledge of basic vocabulary to a higher level. Why should you increase your English vocabulary? Because, not only does it help create a better impression on others, but it allows you to communicate your thoughts and ideas more effectively and helps your understanding of more complex English conversations. It also improves your understanding of what you read in books, newspapers, magazines or on the Internet. One of the simplest and quickest ways of increasing English vocabulary is to learn synonyms for the words that you already know. A synonym is a word that has the same or very similar meaning as another word. Generally, it’s not a good idea to memorise synonyms and antonyms out of context. Try to focus on differences and collocations. There are two dictionaries that I can recommend to you: the Longman Language Activator and Oxford Learner’sThesaurus. They have arranged synonyms and give accurate definitions and examples that help you to distinguish between similar words. Plus, read widely on various topics and use the dictionaries routinely and your vocabulary will improve by leaps and bounds! read more here. Here are two great video presentations by Richard Ford (Q Language Hong Kong English Teacher) that give you examples of how you can increase your vocabulary and make your English sound much more interesting by learning synonyms for basic words you already know. Again, please note that Richard only gave a few examples of the numerous synonyms for these two words. 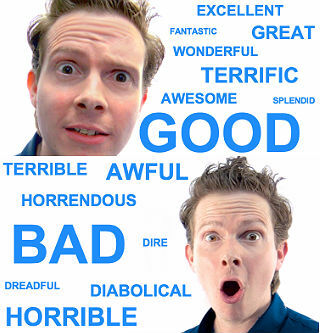 If you have a copy of the recommended resources mentioned above (Longman Language Activator and Oxford Learner’sThesaurus), or any good English Thesaurus, search for the words good and bad and you will see just how many other words you could choose to use instead, depending on the situation.